Cullis returns to the EVP Eagles after being away for school. During her time in London she coached the London Sharks. 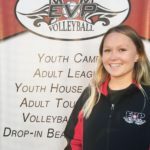 Cullis is no stranger to the OVA circuit, having now exercised all of her playing years as a member of both the EVP Eagles and Burlington Blaze, where she won Provincial Silver and Gold medals, along with a National Silver medal. A defensive anchor, Cullis has been capable of bringing her mental strength from her competition days and dedicate it towards coaching a young team.